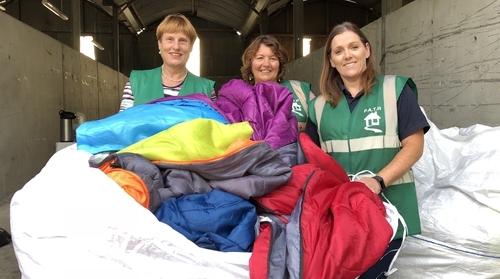 Volunteers from Portlaoise Action to Homelessness (PATH) are asking members of the public to help them launder more than 650 sleeping bags they collected from campsites after the Electric Picnic festival. PATH Chairperson Irene Redmond estimates the team collected 660 sleeping bags. "One man’s treasure is another man’s rubbish. We put a call out on our Facebook page asking for the public to take home a few sleeping bags and wash and dry them so we can hand them out to the homeless." The PATH team brought the sleeping bags to Laois Shopping Centre on Thursday evening and within an hour 400 sleeping bags were taken by the local community to be laundered. "It’s absolutely fantastic. We have to go and fill the van again with more sleeping bags because we have more people waiting for them," Ms Redmond says. The remainder will be distributed this evening at Laois Shopping Centre in Portlaoise between 7pm and 8pm. The PATH team travels to Dublin every Saturday, where it distributes essential goods, including hot food and drinks and sleeping bags to the homeless.